An interesting thing happened after Tuesday night’s Democratic debate from Las Vegas, Nevada — corporate media talking heads declared Hillary Clinton the winner, even though the only thing she did was come across as a weirdly-calculating politician. As I told my wife after the debate, it’s too bad Bernie Sanders is a socialist, because he was essentially the only authentic person on stage. Former Virginia Sen. Jim Web just came across as an irascible grump; former Rhode Island Gov. Lincoln Chafee came across as a dazed child; and former Maryland Gov. Martin O’Malley just came across as another run-of-the-mill politician. The same media juggernaut that tried to convince Americans for months that a groundswell of support for Jeb Bush’s presidential campaign existed — despite zero polling evidence to back such claims — now wants viewers to believe Mrs. Clinton trounced Sen. Sanders. Anderson Cooper: Secretary Clinton, how would you not be a third term of President Obama? Clinton:Well, I think that’s pretty obvious. I think being the first woman president would be quite a change from the presidents we’ve had up until this point, including President Obama. Translation: Vote for me because I’m a woman! Seriously. I’m a woman. That’s important. The former secretary of state offered zero differences between a future Clinton administration and the Obama administration — other than her chromosomes — and yet she was deemed the debate winner. 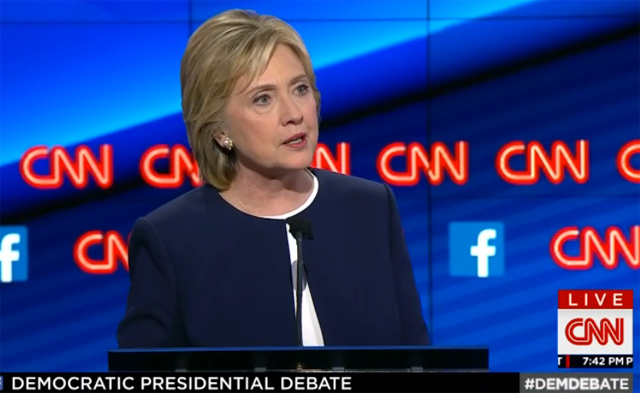 When it came to a very specific question from moderator Anderson Cooper — “Do black lives matter or do all lives matter?” — Clinton simply didn’t answer the question. She went off on a tangent about the criminal justice system. Sanders, however, answered the question. Anderson Cooper: Do black lives matter, or do all lives matter? Let’s put that question to Senator Sanders. 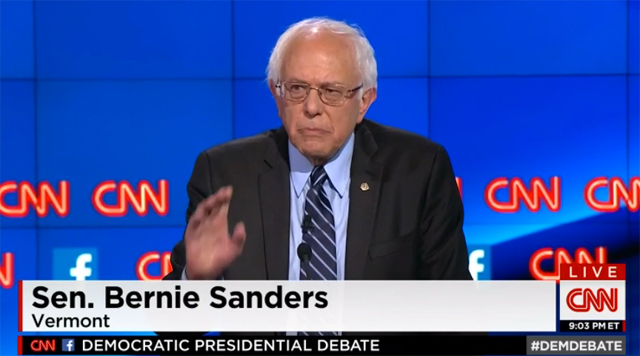 Sanders: Black lives matter. And the reason — the reason those words matter is the African American community knows that on any given day some innocent person like Sandra Bland can get into a car, and then three days later she’s going to end up dead in jail, or their kids. Is it rather repugnant to rhetorically elevate the lives of black Americans above the lives of all Americans? Yes. At least Sen. Sanders, however, had the guts to give a straight answer in front of millions of viewers. A woman who casts herself as qualified for the position of commander in chief because of her estrogen levels, while simultaneously refusing to answer direct questions, cannot be the winner of a presidential debate. Corporate media pundits are less interested in telling the truth than they are with pushing their own specific visions for the world. That is why so many people rightfully do not trust what they see on cable news or what is served to them from the official Facebook news feed. As the 2016 presidential campaign gains steam, it is always important to consume news with a discerning eye. The networks and publications telling you they can be trusted are often lying. As Mark Steyn pointed out, Hillary is an Alpha female among Beta males, which pretty much sums up the Democrats in general. And all of the male candidates avoided talking about foreign policy. Their #1 priority is to provide paid maternity leave for illegal immigrants (including Syrian Trojan Horses) so they can have anchor babies while getting free college tuition and free medical care. Hillary did boast of “getting a lot of business done with Russia.” (Like selling them half of America’s uranium.) And she wants to “build on the successes of the Obama administration.” Maybe more middle class workers can lose their health insurance. Or maybe we can help North Korea acquire nuclear warheads and ICBM’s, like we did with Iran. None of which matters. Hillary is the media’s Chosen One. Sanders may be more popular with rank-and-file Democrats, because he promises to give them the most Free Stuff. He may even win some primaries, but Hillary will still get the nomination. If the FBI finds evidence of felonies, she will still get the nomination. If she has a heart attack and drops dead, the DNC will do a “Weekend At Bernie’s,” prop her up on a hand truck, wheel her around, and continue the campaign. And no one will notice the difference. The investment bankers who run both parties want Hillary and Jeb to be the nominees. Either way, the crony capitalists will continue to get richer and richer. While bias is no doubt a factor, I’d also wager that part of the “OMG, Hillary totes won the debate, you guys” narrative is a result of lowered expectations. Think about all those campaign appearances leading up to this debate appearance, where she tried to so hard to be witty and carefree. She was instead so stilted and robotic that even life-long Democrats were saying, “Good Lord, what a train wreck! I’m supposed to support this woman?” Hillary knew the moderator wouldn’t be aggressive with her (as well as reasonably expect the other candidates not to overtly attack her), so all she had to do was stand there facing the audience and stick to her prepared remarks. Unlike Jeb, Hillary is a shoe-in for her party’s nomination (barring Obama throwing his support behind Biden), but she’ll always be a lousy campaigner and debater. That’s why she lost in 2008, which was supposed to be a sure thing for her. If the GOP nominates someone who will actually take the fight to her and not let her get away with her usual deflections, she’ll repeatedly embarrass herself and depress her base. I will give her credit for her leadership ability in this one area: she has, through various means no doubt (including likely intimidation), corralled the entire Democrat party establishment and the corporate media into supporting her nomination despite being a potential defendant in a criminal investigation of mishandling of classified military and government information while Secretary of State (among many other disqualifies). Too bad she will never use such leadership skills for the benefit of the United States. But the Clintons have never been about the country and its needs: they are for themselves. I find it to be such a shame that Rudy Giuliani dropped out of the Senate race in New York in 2000: he could have beat Hillary Clinton and ended her political ambition once and for all at that fork in the road (I just wrote a long piece on this interesting twist of history). But he exited and allowed her to begin her assault on the presidency, and here we are. Speaking of strange historical forks in the road, there will always be that “What if?” Mike Ditka ran against Barack Obama for Illinois’ open senate seat in 2004.